Lather. When we talk about lather, we talk about three basic things: how easy it is to lather the soap, the texture, and how much lather you get per whipping. To us, a great lather basically looks like this: a little bit of soap easily whips up into a lot of lather with a smooth, firm, satisfying texture. Pretty simple! Scent. Like we said, find something that works for you, but scent plays a major role in which shaving soap you’ll end up using. 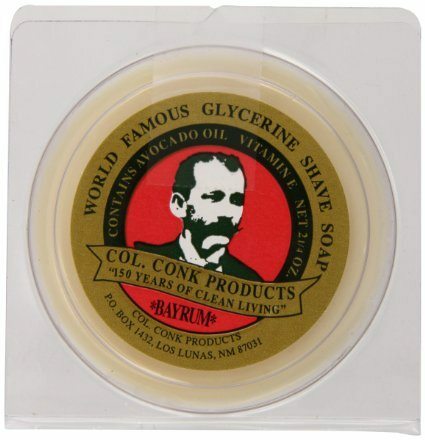 We typically keep several shaving soaps on hand, since our preferences and moods change from day to day. For example, the shaving soap that won this contest is a distinctly summer soap. Shave. A good shaving soap provides a lot of lubrication, sufficiently softens hair and exfoliates your skin. We usually like to apply a pre- and post-shave shaving gel, but sometimes, the best soaps are smooth enough to be used on their own (depending on how sensitive your skin is, of course). Packaging and design. It may not matter to everyone, but it does to us. We’ve said it before, and we’ll say it again: shaving is about the overall experience. Things like packaging, design and style and really add to (or take away from) that experience. Along with the criteria of what makes a good shaving soap we want to tell you what the top benefits that come with using shave soap. You’ll want to kiss your Barbasol can good bye forever once we’re through here…that is unless you plan on rocking the cave man look. Shaving is hard on your face and unless you intend to go on tour with ZZ Top, you are going to have to deal with it for the rest of your life. Your skin is going to get a little rough now and then, but there is a way to protect it. Using good quality shave soap will ease the damage that is done with your daily razor assault. Using a shave soap that is of good quality will help to restore some of the moisture that your face definitely needs and it may even leave your skin feeling softer and smoother than ever before. Shaving can leave your skin feeling dry, which can make shaving a literal pain. Shave soap fixes this issue too and will make your shaving experiences enjoyable. The whole point of using something that produces any kind of foam is to get a closer shave. The foam helps the blade of your razor to get closer to each hair follicle all while still hanging out on the surface of your skin. This system works even better when you have foam that is created by a good quality shave soap. Actually, shave soap doesn’t really create a foam like you get from an aerosol can. Instead you work up a fierce sudsy lather that really trumps a handful of foam any day. The suds from the shave soap really hang on to each hair follicle and will allow you to get one of the closest shaves possible, especially when teamed up with a good razor. You’re skin will be left feeling super smooth and you will be stubble free for longer this with shave soap. A lot of men use canned shaving cream as opposed to shaving soap because it appears to be the more frugal option. This is not totally true though, because there’s a benefit here that makes shave soap even more appealing than an old can of foam any day. Shave soap lasts so much longer than a can of shaving cream. 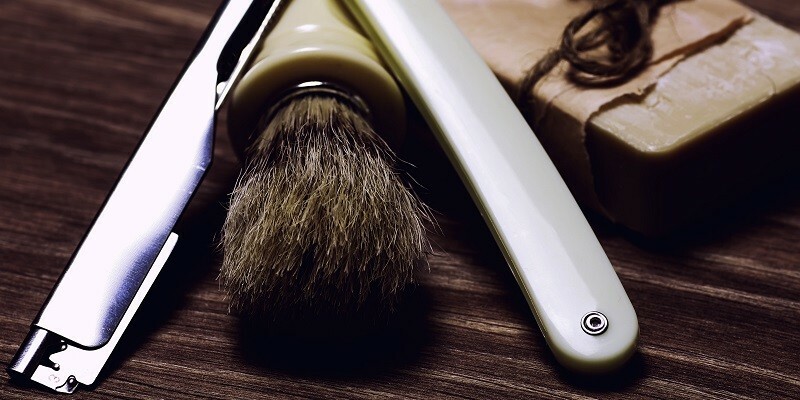 Sure, you have to make the initial investment in some good shave soaps and we know they can cost more than a few bucks like a can of shaving cream. After your initial purchase, however, you won’t have to buy any more for quite a while, thus you get more bang for your buck. So, if you add the quality of soap and the amount of time that you can hang on to that little puck of sudsy goodness – you have a winning combination. These are just three of the awesome benefits to using shave soap, but we really could keep going. We won’t though because we’ve got lots more to cover. The guys over at The Art of Shaving know what they’re doing. This soap smells delicious. And it’s gorgeous. If you opt to buy the soap with the bowl, you’ll get a really cool-looking wooden bowl. After that, you can just buy refills. 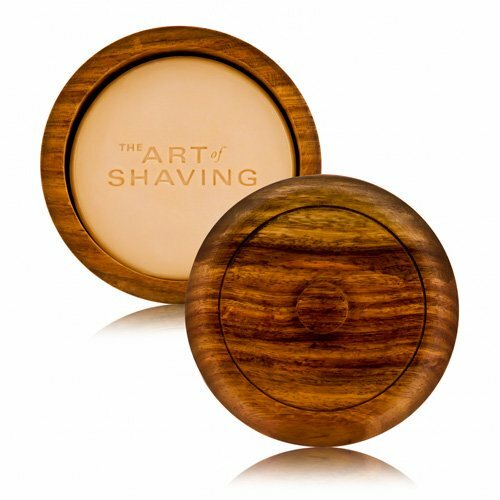 The whole caboodle – the wooden bowl, the classic antique-looking design, the sandalwood smell – all of it together makes you feel like Ron Swanson, which is pretty much exactly what we want out of our shaving products. You get a ton of lather per whipping. Really, the lather is amazing. With just a bit of soap on your brush, you can whip your mug almost totally full of lather. It may be the best lather we’ve seen of any soap. It whips up into stiff, manly peaks – like a couple of overbeaten egg whites standing up next to a steak. The scent is really nice, too. It’s a strong, masculine sandalwood scent with some subtle, earthy undertones. It’s strong, but not totally overpowering. Honestly, it may not be something I’d use every day, but, as I’ve said before, shaving soaps are like colognes, and I prefer to keep several different soaps on hand depending on the season, the occasion, and my mood. Still, it smells really, really nice. Lastly, the shave is a dream. Compared to the Art of Shaving’s shaving cream, the soap seems to protect your face a bit better. Most people find they cut themselves far less with the soap. Plus, the soap tends to last a helluva lot longer. At the end of the day, this is one of, if not the best shaving soap on the market. If you’re serious about shaving, a good shaving soap should be an essential part of your kit, and this is definitely worth the investment. It’s no surprise this is the best-selling shaving soap on Amazon. The new 2012 version of Proraso shaving soap is Paraben-free version (for those of you who don’t know, Paraben is a chemical used as a preservative in cosmetics; however, since being linked to some cancers, lots of companies are starting to stay away from them). The packaging is nice but not the best. 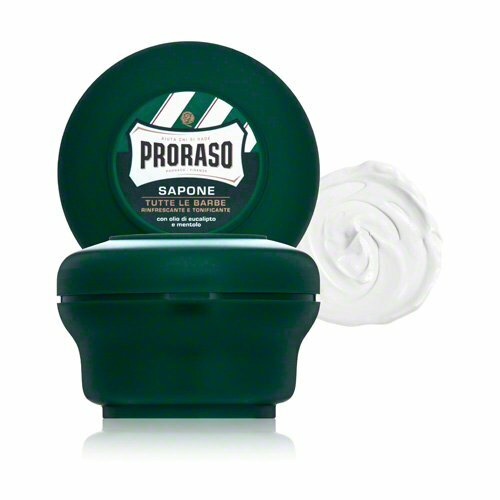 The soap comes in a rounded plastic container sporting Proraso’s new striped logo, reminiscent of old-school barbershops. It’s not the most luxurious packaging in the world, but with a simple, matte pop-off top, it’s easy to handle during a wet shave – much easier than some of the slick, plastic, screw-on tops we’ve seen. Proraso was clearly thinking about function when they designed it. Of course, one of the defining characteristics of this soap is the smell. As soon as you pop off the lid, the menthol and eucalyptus fills the bathroom. It may even be too strong for some, but we really loved it. It has a rather dramatic refreshing effect. It puts a little spring into your step after your shave. It also slightly tightens and cools your skin, making for a very comfortable post-shave. The lather on this is also extremely nice. A little bit of shaving soap goes a really long way; you should easily be able to get three passes out of one whipping. It yields a smooth, silky texture rather than a stiff one. The Proraso soap lather felt a bit more like a mouse than whipped cream (don’t worry; we didn’t taste it). As soon as you apply the lather, you will immediately feel the cooling effect of the eucalyptus and menthol, making this an excellent summer shaving soap. Because the cooling effect is so nice, we recommend using a bristle brush instead of a badger brush, so you can really massage the cream into your face. Overall, this shaving soap is really nice before, during and after the shave. The eucalyptus and menthol make it a totally different experience than most shaving soaps. It also produces a great lather and lots of it. At around $10, this beats out most expensive shaving creams nicely. We have reviewed tons of Col. Conk products on here. We love them. You guys seem to love them, and they are just really great products all around. It also helps that they are distributed in one of the coolest, old school containers we’ve seen. It has an awesome tradition and legend. Col. Ichabod Conk left the military and married a barber, and basically learned to be a barber too. He made shaving soap and accessories until he died in the 1890’s. Decades later, a company learned of his legacy and started it up again. Since then they have been a world wide leader in men’s shaving products. Col. Conk products have been around for ever. Col. Conk products continually rank as some of the best products out there, and they can always be found at a reasonable price. The soap has a classic look. It whips up into a thick, foamy lather, and it leaves the skin feeling exfoliated. The Bay Rum scent is hit or miss with some people, but we love it. It smells like what I imagine George Clooney smells like. It has a deep, rich, musky smell that resonates. However, it’s not a grandpa smell (sorry grandpa), it’s just a strong, masculine smell. And it’s strangely refreshing! Their products have really shown to be able to stand the test of time. And you will likely end up saving a bunch of money with the soap because a little bit of this lather goes a really long way. Also, women just tend to love this stuff. They like to go into our bathrooms and see manly shaving product producing a manly musk. It’s really a win/win. It should also be noted that because of the price of this soap compared to the price of other types of shaving cream, this soap can stand to save you quite a bit of money in the long run. This soap can be picked up for under $5 usually, and it will last about three times as long as canned shaving cream. You can do a few tricks to make it last longer as well. We can use more water to have a thinner lather, or you can add a little water to a smaller section of the puck to get a thicker lather and stretch it further than you normally would be able to. After getting a comprehensive look at Col. Conk shaving soap, we decided it was a very worthy contender. Not quite enough to win the contest, but they are certainly worth mentioning. All in all, it would be an excellent soap to try and see if it works for you! Van Der Hagen has been producing quality products for over a century. They are a Dutch company, and they produce high-end men’s grooming products. Aside from that, this soap has a ton of great features! Van Der Hagen soap is vegetable based and is not tested on animals. This may seem like a small benefit, but it’s something we always try to keep an eye out for. We have found that most of our readers do as well. Van Der Hagen is also hypo-allergenic. The lather is certainly exceptional. Just a little whirl of the shaving puck and this stuff whips up into a nice, thick lather. The lather is easily manipulated. You can add a lot of water for the lather to be thin or less water if you would like the lather to be thicker. The lather is also long lasting, and it wont leave the face feeling dry. Instead, this lather also acts as a moisturizer, and it generally leaves the face feeling smooth, light, and exfoliated. it has a lite fragrance. This is good for those who found products like Col. Conk overbearing. The fragrance is not much different than most soaps on the market. 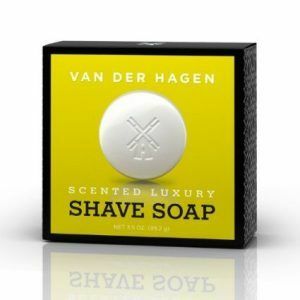 With all the added ingredients that come in Van Der Hagen, the soap performs well. It adds a very clean lubricant to your face to protect from razor burn or any sort of irritation. Although, you will need to give your face a good wash after. We found Van Der Hagen tends to leave a waxy residue after you’re done shaving. This wasn’t a big deal, we have found this before with other soaps that contain glycerin, but some people might find this irritating. However, giving your face a quick rinse was a quick remedy for that. Also, this product isn’t going to break the bank. It’s a simple product that lasts a long time, and it wont hurt your budget. With other styles of shaving cream you are forced to buy 5-6 of them a year. That number should severely decrease with the Van Der Hagen shave soap. a very small amount of this soap goes a long way. If you are doing it correctly, you should be able to triple the lifetime of your shaving soap compared to canned shaving cream. Additionally, it’s just not a soap that is very expensive. We have run into plenty of soaps that can cost up to $30 maybe more! You can pick this soap up for well under $10, and you will definitely get your value out of it. We recommend checking out your budget and seeing how this soap will affect it. There are a few things that we thought kept this soap from winning the competition. However, overall, it is a quality soap that provides an excellent shaving experience. For that reason, we thought we should include its results in this competition.